Last month, fellow ELI Gulf Team member Teresa Chan and I travelled to Mississippi to attend two public events hosted by the Deepwater Horizon natural resource damage assessment (NRDA) trustees: a community education workshop in Gulfport, and the Trustee Council’s annual public meeting in Long Beach. On the evening of July 18, we headed to Gulfport’s Marriott Courtyard hotel for the trustees’ community outreach workshop. It was a two-part event: the first session was a “Natural Resources Damage Assessment 101” (which focused on the NRDA process, but also included overviews of the restoration efforts taking place under the RESTORE Act and through the National Fish and Wildlife Foundation); the second session covered how the public can submit restoration project ideas to the trustees. Despite the heavy rain that evening, we arrived to find the ballroom crowded with attendees – including some folks who were participating in a NRDA meeting for the first time. After the presentations, a panel made up of staff from the federal trustee agencies, as well as a RESTORE Council staff member, listened to and answered questions from the audience. Unlike a typical public meeting, this format gave attendees an opportunity to hear the answers to other people’s questions. Attendees were also encouraged to provide feedback on the event and other input on how the trustees might “promote more effective engagement” of Gulf communities. While we were in Mississippi, we also had a chance to catch up with some of ELI’s partners and friends. On our last day, we visited Turkey Creek, Mississippi, where the first phase of a NFWF restoration project is in progress. 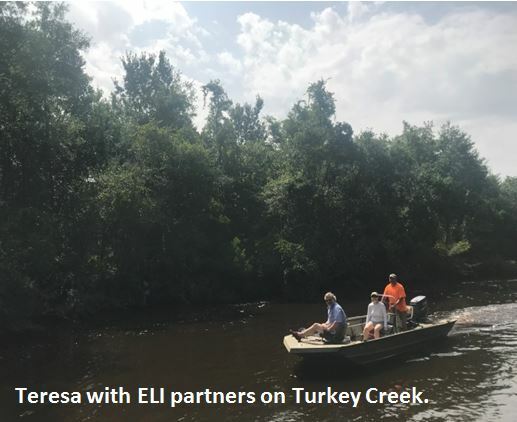 We toured the creek by boat, learning about the restoration effort and spotting lots of wildlife in the process – it was the perfect way to end a great trip. We hope to be back in the Gulf soon, but in the meantime, we’re always available at gulfofmexico@eli.org if you have any questions or would like to chat with us about restoration.